WISE COUNTY, VA — A report released today highlights the economic development potential of more than a dozen abandoned coal mining sites in Southwest Virginia that could be repurposed into solar farms, community parks, sustainable farms or other innovative projects with funding from the RECLAIM Act, now pending in Congress. The report, “Healing Our Land, Growing Our Future,” identifies 14 sites in seven counties that represent the best potential for reclaiming old coal sites and re-developing them with projects that yield lasting and sustainable economic benefits for the surrounding area. 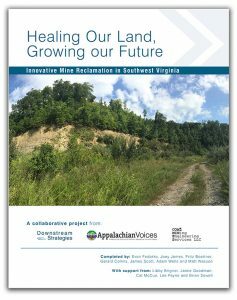 Appalachian Voices partnered with Coal Mining Engineering Services LLC and Downstream Strategies to design and implement the analysis of 500 sites in Southwest Virginia officially designated as “abandoned mine lands” (AML) by federal and state regulators. AML sites were closed prior to passage of the 1977 Surface Mining Control and Reclamation Act, which established mining fees to fund reclamation of the old sites. As the coal industry continues to decline, many Central Appalachian communities are struggling to keep afloat while laying the groundwork for a new, more diversified economy. The RECLAIM Act (“Revitalizing the Economy of Coal Communities by Leveraging Local Activities and Investing More”) would accelerate distribution of $1 billion in existing AML funding over five years for projects that specifically yield economic benefits. Introduced earlier this year, the bill has gained significant bi-partisan support. Virginia would receive a total of $30 million. Foxfire Farm, a privately-held parcel which includes several old mines. The owner wants to grow her permaculture agriculture business. Factoring in many unknowns, the team estimated the reclamation costs for all 14 sites between roughly $7.88 million and $16.05 million. The economic development projects totaled roughly between $50.69 million and $52.73 million. The team also outlined several recommendations at the end of the report: 1) Areas mined after passage of SMCRA should not be automatically excluded from RECLAIM; 2) State and federal AML inventories must be updated with modern mapping technology; 3) Federal funding eligibility guidelines should at a minimum mirror current AML funding guidelines; 4) Coordination of other funding tools to address environmental and safety liabilities for sites not eligible for AML funding and that lack an entity responsible for clean-up; 5) Funding should go toward projects that prioritize local investment versus external corporate interests such as prisons and large retailers; and 6) Reform tax structures to motivate land-holding companies to engage in prioritized projects or sell land to an appropriate entity.